Stories and story-tellers, books and authors, food and fun times for children and families. 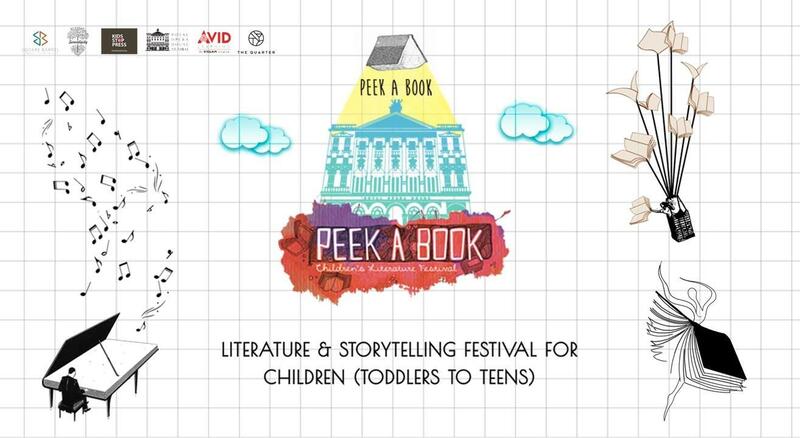 Peek A Book is a one-of-a-kind literature festival with carnival-like atmosphere that recreates the magic of words, language and stories; of books and authors, particularly Indian. Ticket required for all attendees - children and adults. Children can choose from over 25 different sessions over the day built around the most unique books (fiction and non-fiction) of 2018 and stories. Adults must accompany children – Peek A Book takes no responsibility for children unaccompanied by adults. Sessions for children between the ages 3-15 years AND for parents too! Food and drinks will be available for sale at the venue – and are not inclusive in the ticket cost. A few of the sessions are designed to include visually and hearing impaired children. Children experience unique story-telling and story-tellers. TV personality Tara Sharma talks of the exciting adventures of a dog detective. Prerna Bagaria of Mann Mela takes toddlers on a story walk, actor Dhanendra puts a folk twist on the Panchatantra. Peek A Book also features sessions to include hearing and visually impaired children with Usha Venkatraman and Siddhant Shah. Discover the most mouth-watering way to eat a Mango with Natasha Sharma. Can you hold your Pee? Asks author/actor Neha Singh. Meet Rani Rasmalai and Raja Balushai of Mithaspur with Prashant Pinge. Illustrator Tanvi Bhat introduces you to a most unexpected Lal Pari. Meet Lavanya Karthik’s high action Ninja Nani, Dive into a graphic novel full of wildlife adventures with illustrator Rohan Chakravaty and author Bijal Vachhrajani. Learn to be Radio Joc with RJ Anita of Radio One. Explore the nooks and crannies of Opera House in pictures with photographer Zahra Amiruddin. Sharpen those pencils as illustrator Shamika Chaves takes doodling to a whole new level. Imagine your own robots in Pomegranate’s SciFi writing workshop. Parents can take a heritage walk of the opera house, get tips for reading aloud and telling stories and attend sessions with children. Or shop at our curated bazaar or grab a bite at the food court.